Does Your Organization Already Have a Policy for Professional Conduct? My YMCA colleague posed for this photo on purpose to illustrate a point about professional conduct and social media policies. As part of my work as Visiting Scholar at the David and Lucile Packard Foundation, I’ve had the honor to facilitate training workshops at grantee’s conference. I just returned from doing Networked Nonprofit and Social Media workshops at the National Summer Learning Association’s Conference in Indianapolis. As I discovered when I did an online chat with this community, this field includes a mix of educators, nonprofits, government agencies, and universities – and I learned so much from the people in the workshop. Since I had a lot of educators and people who run summer camps and other programs, a policy question came up. It goes something like this, “I’m on Facebook personally and it is easy for me to connect with the kids in our program that way, but should I be?” There were also questions about how much to monitor what kids were doing online, what the policy should be, and what are the teachable moments. The teachable moments discussion was rich. It reminded me of workshops I did with educators in the late 1990s and the discussion about school filters for google searches. “What if the students encounter in appropriate material.” I remember one teacher who used it as a teachable moment. For the policy issue, I suspect there are already policies about professional and appropriate conduct in the human resources area that can easily be translated to social media. 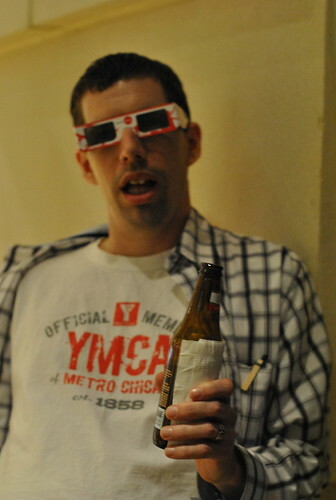 My colleague above posed for me in an organizational t-shirt and holding a bottle of beer. He said that there is a policy in human resources that says something, “if you’re wearing the organization’s logo, don’t go to the bar on Friday night and get slushed …” In other words, if you’re representing the organization, professional business conduct is expected. Certainly,this can be easily referred to in a social media policy. While the workshop was talking place, I noticed this woman on her blackberry. After the workshop, she told me that she was texting her staff to look at resources I was mentioning, allowing for remote real-time participation in the workshop! I was lucky enough to have a colleague, Rebecca Krause Hardie in the room. You can find the slides and materials on my wiki here. I also raffled off some copies of the Networked Nonprofit and a copy of Carol Cone‘s new book, Breakthrough Nonprofit Branding. Beth, A great post with even more useful presentation. Very wise advice. I might add that we all need to remember that once a photo is posted online anywhere–one’s Facebook page, or a blog, for example–even this photo, on this blog–it’s immediately out of your hands, and you have absolutely no control over where and how that photo may be used online.